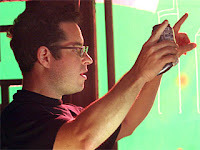 JJ Abrams is Pissed He and Star Trek aren't at Comic Con!! Proudcer/Director JJ Abrams is not pleased with the brass at Paramount. He recently said to SCIFI Wire, that he feels Star Trek and the rest of Paramounts upcoming lineup should be at Comic Con next weekend. He went on to say. "I would have been psyched just to show some of the stuff that's about the people. Because it's not really about the visual effects. But with so little done ... . And this was a big kind of strategic decision on [Paramount's] part. so I was disappointed." He then added, "they're not going to take anything." "G.I. Joe's not going. Transformers 2's not going." Paramount pulling itself from Comic Con was a major blow to everyone excited for this year's panels including Abrams. Paramount has said the reason for pulling its panels was that the majority of them were not panel ready. "Our visual effects, unlike something like Iron Man, we have well over 1,000 visual-effects shots," Abrams said. "It's a huge thing. So I'm very disappointed, because the characters are so good, the actors are so good." Abrams later said he really wanted to show the fans the tone of the film and the relationships between the crew of the U.S.S. Enterprise. Abrams said, "And so the idea of maintaining character relationships, the dynamic between the characters, [was key]. I never saw how Kirk and Spock became so connected. And that's what this movie does. And it does it with the entire family of the Enterprise." From the sounds of it Abrams is really going to do justice to the Star Trek universe and hopefully reboot the series into soaring new galaxies. So, what are your thoughts? Should Paramount still had a Star Trek panel regardless of no panel worthy footage? Is JJ crazy to think Trek fans would flock to see anything in regards to their beloved franchise? One thing is for certain, if the new Star Trek isn't good, it will be the end of Trek, Star Date Never!